The Pz 68 is an upgraded Pz 61 with a new higher turret. Manufactured by Eidgenössische Konstruktionswerkstätte Thun, it entered service in 1971. It retained the same firepower and level of protection, but had an improved MTU MB-837, which generated 660hp. It was mostly the sub systems of the vehicle which were improved. It had a new fire control system and gun stabilization system so that it could fire on the move. A total of 390 were built, but hit the headlines due to some major defects of the vehicle and it was even deemed not fit for combat. The problems with the vehicle were ironed out when nearly 200 where upgraded to the Pz 68/88. The Pz 68 hull was used for combat support vehicles such a Armoured Recovery Vehicle and Armoured Vehicle Launched Bridge. 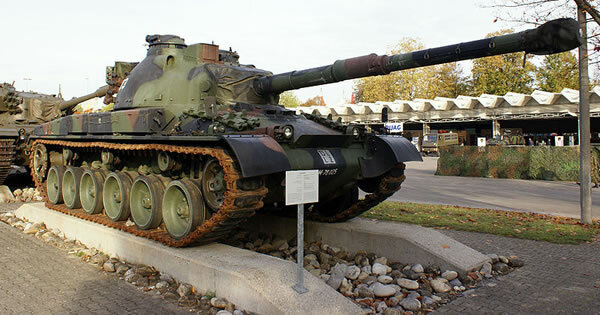 The vehicle was retired in 1999 with the replacement of the licence built version Leopard 2, designated the Pz 87, which is a formidable tank.